So, the question is, do you think these images are much better or any different in quality from the iPhone’s images? I had hoped for more richness and depth from the Ixus. In the photos here, the yellow has an unwanted green tint to it and is not so rich as it was in the metal. I have been trying to photograph highlights and reflections, leading me to understand how amazing the human eye is. A seemingly bright and clear reflected strip lamp wending across bodywork becomes a washed out blur on my Ixus and iPhone. What I see is not what the digital camera sees. Wikipedia needs some serious sub-editing. It might be full of information, but full like a landfill is full. Information is often presented in a rather messy way, the result of a lack of a central editor of the calibre of Simon A. Kearne. I used the best part of 40 minutes trying to untangle the basic facts of the RX-2 so you could understand it without getting a migraine. Ready? (Remember, even if my version is still wrong it is at least easier to digest). In 1970 Mazda began offering a vehicle bigger than the Familia (3.85 metres) but smaller than the Luce (4.3 metres). In length it measured 4150 mm and had a 2040 mm wheelbase. Mazda called this mid-sized car the Capella, forerunner of the “6” cars we love today. The Capella could be bought as a saloon or as a two-door coupe (looking like this specimen, above). The car had a rear-wheel drive layout, with a transversely mounted engine which could initially be had as an L4 of about 1.6 litres or as a Wankel of 1.1 litres. That Wankel-powered car was sold in Japan as a Capella Rotary. Outside of Japan the Capella Rotary was sold as a Mazda RX-2. Wikipedia’s curators make a big deal about the headlamps of which there were two types: square and twin round. According to Wikipedia (and I don’t know why people are so concerned with this at all) all models from 1970 had square lamps. Then the twin round lamps were introduced for the Wankel-engined models in October 1971. And in 1972 they all got twin round lamps until a major facelift in 1974. Can you remember that? Try it this way: square lamps all around, a transitional period with square and twin-round lamps and then all the versions got twin round lamps. If it helps, imagine the circular rotary engine being like the circular lamps. The revised 1974 version stayed in production until 1978. Now we know how to place this car we can turn to its interior and its aesthetic merits. The slide show shows a nice ashtray of the horizontally lower-hinged type. It has a lip or flange on the top edge as wide as the ashtray itself. That is excellent from the point of view reaching for it to open it when driving: Fitts’ Law, as we all know by now. On the downside the ashtray does not open very far forward from the surrounding surface. They really needed to give it a pull out drawer or a deeper “bucket” than they actually had. The funny thing is that there is quite a lot of space above and below the ashtray, some of it wasted on some kind of a ridiculous cubby that could easily have done without a centimetre of height. Notice the nice transverse pleats on the seats. The radio has been well-located too, high and central. Ahead of the driver can be seen three deep-cowled instruments, which lends it an appropriately sporty character. I tried to see if this 1972 coupé interior differed much from the saloon and came back from my search lacking in confidence to say much more than the saloon may have had a different dash, missing the console between the upper dash and the fascia where the gear lever is. The only evidence I’d call reliable would be a set of catalogues in chronological order. That’d cost at least a hundred euros to obtain. It’d be cheaper to visit Mazda’s museum in Hiroshima. Having sat in the car (they left it unlocked) I can report a very upright driving position and a feeling the window was very close to me. The gear lever fell close to hand and the seating felt supportive. What must this be like to drive? The RX-2’s exterior styling has something in common with Fords and Opels of the time. It’s more American than Italian. It is pleasant enough without managing to be all that distinctive. There are no very precise words for the kind of surface developments going on along the RX-2’s bodyside. It’s not organic, is it? It’s not especially square, not like a 1980s GM car or 1983 Volvo 740. There are very subtly changing radii between the main surfaces, the character of which stumps me. Some of the nicest 1960s and early 70s American cars did this and I don’t know where it came from before going away again. It’s not geometric either. It owes nothing to aerospace that I can detect. From this I can conclude it’s pure car design using car design idioms and tropes. By sheer and utter coincidence, the same dealer had a yellow Suzuki Swift Sport in the car park. I must admit that seeing the Swift on the street has changed my impression of this car. I can see what they were doing with the new version and it both retains some links the outgoing car while also pushing the theme in another direction. And it’s available in yellow. I have also seen them with go-faster marking and they do not look absurd. So, I have revised my opinion and consider the Swift to be a good bit of design after all. Sorry, can’t help much with the camera. There seems to be a lot of distracting reflections on the RX2 photos, but that may just be the time of day when the photos were taken. Also interesting to see a 70’s restoration at a new car dealership. In Canada, the Mercedes and BMW dealers do that a lot. I guess they are trying to emphasize the durability of their cars. (Which is kind of bogus in BMW’s case, given how fast their 70’s era cars rusted). RX2s didn’t sell very well in Canada. One I do remember belonged to the renowned “environmentalist”, Dr David Suzuki, who lived in the same neighbourhood in Vancouver as my parents. Like many Mazdas of the day car, Suzuki’s car was light blue, which seemed appropriate as it matched the cloud of blue smoke that the thing pushed out the back. Careful with the quote marks, Mr Martin, please. Shall we stick to cars because I see a) “a can of worms” and b) “a can opener”? Yes, I noticed car dealers like to put an old classic in the show-room somewhere. In Mazda´s case it does them no hard since Mazdas now and Mazda´s then are very consistent: pretty nice cars, made pretty well for a fair price. For Mercedes and BMW their past hits are something of an embarassment. That´s not all that original a point. More interesting is that for certain other brands like Mazda, showing their older cars only makes the current brand seem even more interesting. Think about the brands who could show without shame their previous hits: Ford, Opel, Toyota, Renault, Subaru, Nissan and, I suppose Rolls-Royce. None of the Japanese brands appear to have a conflict between their previous hits and their current range at all. I can imagine the back-then-owner of the 1972 Mazda being able to accept Mazda today. The restored cars in the Merc and BMW dealers here are typically the 450SL and the 2002 and 3.0 Coupes. Basically the cars that people take the trouble to restore. 128C + GTV = RX2? Discuss. 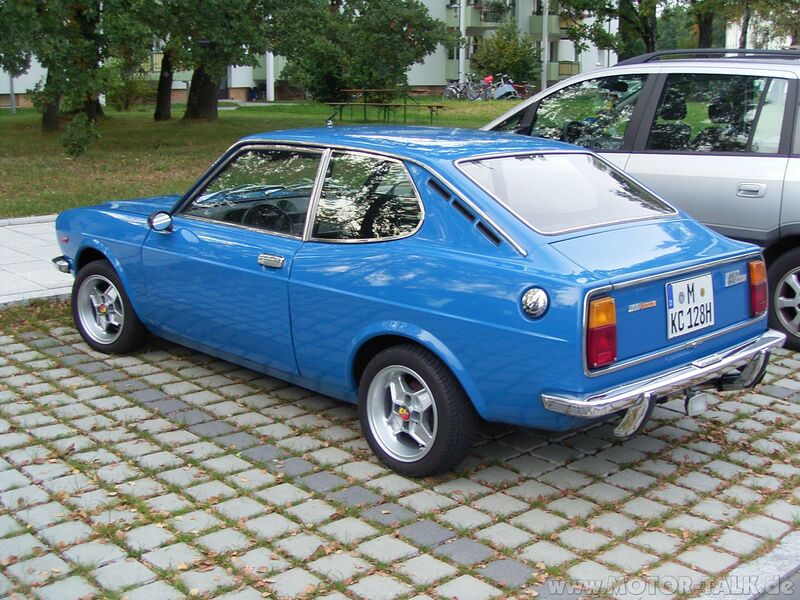 (And, class, you will have to do your own research, as I am too dumb to be able to upload a picture of the Fiat 128 Coupe). So, while I also get elements of Ford & Opel, “more American than Italian” seems a fraction bold in the light of the equation above, in my eyes. And, whilst in a reverie/nightmare of double maths on a Wednesday afternoon (was there ever anything more narcotic? ), I realise that I have have stumbled upon the long searched for answer to the question of what is a Grand Touring car: GT = (RX2 -128C)/V, obviously. Surely they cannot still deny me the Nobel prize after this ground breaking work? I assume you meant the original, not the later 3P model. Excellent algebra. I was the annoying geek that loved double maths. Richard, you tell us (possibly sourced from Wikipedia) that the RX2 has a transverse engine and RWD. Can this be true? Surely a perverse way to arrange the drive train. Have you tried adjusting the white balance (WB) on your camera? Photography with artificial light is very tricky so change of WB or bracketing the exposure may help. Interesting comments about older cars in dealers’ showrooms. Just left the Forester in for a service and there was a nicely restored Lada Niva in the Subaru showroom. Why? My explanation failed. The Capella has a normal engine and the Capella Rotary had a Wankel. The Capella Rotary was sold as the RX-2 outside Japan. I need to rephrase it a bit as my text is ambiguous but have you seen the mess at Wikipedia? It feels like this could have been a nipponised Renault 12 coupé. I quite like the shape of the rear window,it gives a lightness to the profile that, perhaps, Japanese coupés of that era often lacked. It reminds me of the 1981 5dr Toyota Tercel we had at home, I don’t know, maybe the way the metal is pressed and some shapes here and there. It was, I think, an unfortunate-looking car (looked kind of angry and/or depressed to me) but seemingly built from a roc. Everything felt solid and good quality, even down to the plush navy blue carpet that made me realise we were being cheated by French and other car manufacturers. What a coincidence this is for me. Was looking over Mazda’s piston engines last night on Wikipedia, because I was interested in the Montrose as it was called in the UK, the follow-on from this RX2 body. A very tough car that sold well here in Canada before they went to FWD .The engine variations since the 1960s are staggering. No matter. Wikipedia can be frustrating and incorrect sometimes, but they do try. 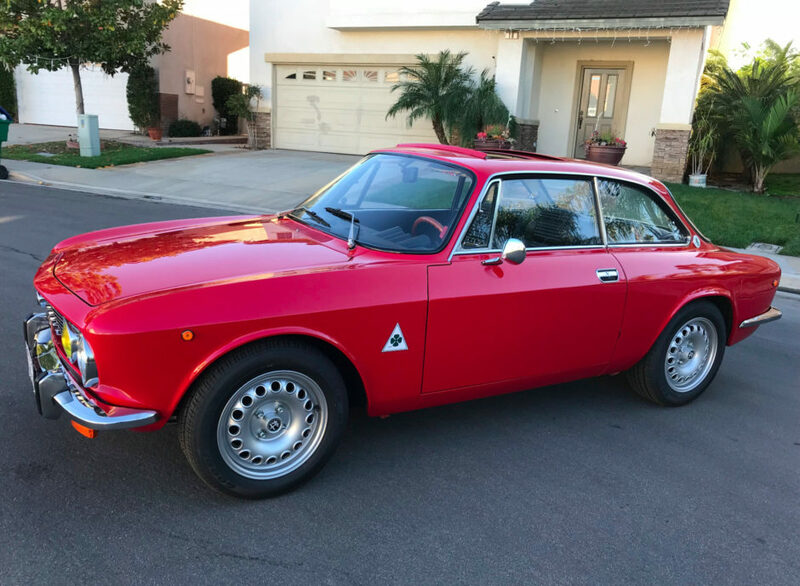 What becomes obvious when trying to search for details of a car for a DTW quiz, say, is that the anoraks of the world copy and plagiarize Wikipedia with gay abandon. There will a dozen search entry precis in a row all with the exact same words, happily lifted for nowt from Wikipedia. Original writing is uncommon. As I used to say 15 years ago, the WWW is a million miles wide but only an inch deep. Nothing’s much changed. If you want real detail, look elsewhere. Of course, there are exceptions and DTW is one of them. To the RX-2. The rotary engine wasn’t transverse mounted. The driveline was standard north-south with a gearbox and prop-shaft to a solid rear axle just like a Cortina. I always found the RX-2 a little awkward looking, something a bit ungainly about it. When I returned from England to Nova Scotia, Canada in 1974, seven months later, my next youngest brother returned from university in Vancouver with his brand new hawk-eyed RX-3 estate. Well, his wife was an RN you see, supporting him and his studies until he became an MD. The RX-3 was only a bit smaller than the RX-2, but with the same powertrain. For the time, it did not so much accelerate as hurtle, running away from my Audi 100LS like a rabbit on steroids. In Malaise-era terms, it was a hot rod. It was a hoot to drive, with nice gearbox and clutch and an appetite for lots of high octane fuel. Overtaking produced a loud angry hiss from the four choke carburettor, and if in third, the 7000 rpm beeper was quickly bleating away. Giggles often ensued! That thing was a minor Q ship, but a bit understeery if you got too enthusiastic, and the dampers were just fair. Only added to the thrill when you realized you were in a bit over your head! Practically speaking, like all the then current Mazda rotaries, it was not a superlative starter after a winter night’s cold soak. Usually, it caught right away, but if not, it flooded. The usual techniques for ameliorating that condition with a piston engine did not work. Opening the throttle wide and cranking to get the excess fuel out didn’t help. I was called on numerous occasions to try and assist. Unfortunately, the best thing was to wait until later, which did not help getting his wife and himself to work and lectures. The interior fit and finish was superb, but made of, shall I say, inferior materials. Cardboard boxes in the rear of the estate knocking about going around corners would gouge the incredibly thin PVC sheet so lovingly glued to the interior sidewalls. I used to be amazed that such thin stuff could be reliably manufactured and fitted without error. After a year, the rear compartment was a nest of knicks. The winter no-start situation was solved by their moving to a university-owned family house on campus at cheap rent, which site included the teaching hospital his wife worked at too. A bit like winning the lottery, that house, as there were only six available. Nevertheless, a car to be remembered, a characterful little beast. One assumes the RX-2 was similar in that regard. It egged you on and had a cheery air about it. Pity about the awful fuel economy, but the constant use of wide open throttle didn’t help! That’s why in my World-renowned games I tried to avoid answers you could find on Wikipedia or Google Images. I feel like Richard does that with the quiz pictures of some car’s underbelly. Again, my rewrite is in need of attention…. I really thought the car’s underbelly quiz was because the answer wasn’t googable or wikipediable and I thought this was a good thing. It’s ok if it wasn’t. I’m a bit disappointed but I’ll be ok I think. Well, NRJ, in my quest to be somewhat Google-free which includes an outright ban on Home Assistant busily listening in like a Stasi spy to every sneeze, I use the search engine DuckDuckGo. They do not track you. At all. Try it. So far as quizzes go, if one hasn’t much idea of the answer from the wealth of info already stored in the ancient bonce, then a careful search of what IS actually available can assist in the hunt. So there’s that. And in the end well, it’s the journey not the result that’s enjoyable, rather like anticipation trumps the reality of yet another toaster that works like every other, despite glowing marketing words claiming it does a superior job on crumpets. The best ashtray concept ever, I feel is the Canadian- designed K-Tel battery-powered smokeless unit from the late 1970s. Those prairie boys had come up with yet another winner. Today, Amazon and Walmart offer a plethora of latter day copies, some fetchingly designed in brushed stainless steel or other decorative finish. Archie Vicar would have killed for one while testing the Renault 16ts. A packet of dried cabbage leaf Caporals and a half-dozen premium cigarillo ends plus assorted ash would hardly cover the bottom, leaving plenty of room for 40 Craven A cork tip remains for the remainder of the day’s intake. All without a stink! I wanted to buy a home assistant for my parents for xmas but I rethought it because of the reasons you stated. And I’m not usually a paranoid conspiracy theorist type. It’s funny you mention DuckDuckGo. I used it for a couple of months back in the late 00s I think. I must have gone through a paranoid phase fuelled by reading too many scaremongering stories in the Daily Mail. In the end I did find it difficult to bypass Google’s wealth of information and just didn’t get used to the more basic layout and services on DuckDuck. Sadly, like a lot of people, I went ” here Google, take anything you want from me as long as I can use you to check the headlamps of a 1992 Renault Safrane”. But I admire anyone using it on a daily basis. I must add, to clear out any doubts, that my parents are not ex-communist spys, ex-Nazis or anything like that for me to have concerns about Google eavesdropping. Still you never know, better be safe. …..And I tried to Google that 1070s ashtray you mentioned using “K-Tel battery-powered smokeless unit” but nothing came up. I didn’t use DuckDuck however…. Don’t you go and give Richard some ideas about acquiring some pricey units we will have to go and fork out for later on…. I feel like ‘with gay abandon’ best described my writing style on DTW sometimes because i can post a lot, and my posts can be sickenly cheerful. On the ashtray subject, I think it doesn’t take a psychologist to figure out these references are a cry for help from Richard. But ways to allievate the suffering do exist. Take this sleek in-car ashtray from Ebay-China for example. Only 4 euros. That’s not too big of a price that it would be impossible for the DTW readership to chip in and get it to him for the next international cigar-smoking day (this must exists right ?). I mean thank Zeus his flights of fancy don’t cost in the thousands. That would have hurt a lot more to split that amount between 8 people. What a delightful little trinket. I like the tasteful sapphire light. I bet it doesn´t cast any light at all, just leaves a persistence-of-vision track across your retina on dark nights. A lighthouse for your soul, a beam of hope for cigars everywhere. Ah, K-Tel, like JML and Innovations, boldly providing solutions to problems you didn’t know you had. One of my favourite Innovations products was the spare battery organiser, “so you never again have to put up with the misery of hunting for that replacement battery”. What’s wrong with just leaving them in the packaging till you need them? Sounds like the SkyMall magazine on airplanes. Need a cat scratch-tree that doubles as a camping table ? They have it. Mind you, the mag was a godsend on longhaul flights when you forgot to get something to read. I would read every single lines from every products and before you knew it, the flight was over. In the 1980s a whole sub-genre of British comedy existed to poke humour at such tawdry and pointless gimcrackery. I found it funny without knowing what it was deriding; it goes back a long way too because J.B. Morten used to fill some of his Beachcomber columns with lists of silly items like a stanchion for propping up other stanchions. Electric comb cleaner – for cleaning electric combs, fast, efficient, powerful. Belt spooler – tidies and spools your belts for when you are not using them. I didn’t know this J B Morton guy. I just checked him. It seems like that Trevor Montague he was talking about was my forebear in the Quiz industry (says the guy who did 2 lame games on DTW). Dear NRJ, this back and forth is all getting a bit long and difficult to know where to Reply! One website I read consistently has a rather amazing writer who really has a way with words, but whose political views and mine don’t jibe when he goes all earnest US conservative. However, he offers the best commentary on actually DRIVING cars. Not by a little, but by a lot. He was an IT consultant making much loot at one stage, owning two new Phaetons. It was about two and a half ago years that he pointed out that Google was cutting back severely on search results. Then I knew I wasn’t dreaming, because things had seemed to become worse and results less varied and far fewer. It was he who recommended DDG to his blog readers. So I just now put the search phrase k tel smokeless ashtray into DDG. In an instant, the page returned, and the second result: amazon.com: smokeless ashtrays. As I said before, there are a bewidering variety available, and with a bit of Velcro, one could have a combination ashtray and Go-Pro camera holder secured to the dash, ready for action in a minute or less! And detachable to boot! See, google is bloody awful these days trying to surreptitiuosly get me to turn on Assistant and location. Bugger that!. Just because I’m paranoid doesn’t mean they’re not out to get me and send targeted curated ads for things they think I need. You too. Times change, so do search engines. Thank you for your reply. Well, you made me go on DuckDuck for the first time in 10 years so that’s a start. The site has indeed changed since 2008. I typed “Renault Safrane 1992” and the results don’t look bad at all, even the images section. They seem to have improved a lot so I might give it a go. I think it is a very good thing if you take these steps, I don’t think it means one is paranoid. Without going all alex Jones we have had enough evidence showing that all these companies do amass large swathes of information and are cagey about it. Who is the writer you were talking about ? I’d be curious to check some of his articles. Good idea about the Velcro thing. I think we’ll just get a bucket for Richard, stick a bit of Velcro at the bottom and he’ll have the biggest ashtray on the planet. Sorted. Bill: yes, correct about travelling rather than arriving. It´s not true with smoking though. I like the ashtray suggestions. Out of all the ashtrays I´ve examined, the ones which stand out are the Mercedes 190E and the Renault 25, both huge sock-drawers of ashtrays and also made in a very nice way too. The biggest (or smallest) disappointments were the Lancia Kappa coupe and perhaps the 2006 Ford Mondeo, an otherwise very nice car indeed all told. As time goes by I will have to balance the criticism with the correct expectation: today ashtrays are pretty much gone. In the interim years (from about 2005, say, they get smaller and more and more rudimentary). Ashtrays have indeed gone in the EU, as laws now get you for smoking in control of a car. Instead you get drinks holders. Luckily, car accessory shops have ashtrays to fit your drinks holders! This article about a 4.cylinder Familia is verging on the delightful. It´s very good as a corrective to the anti-Japanese car prejudice dished out Ireland in the 80s. Nice one. I wonder if Mazda appeals to the slightly offbeat customer. My mother owned two, an ’87 929 my father bought shortly before his death, and a 1990 626 subsequently. Both rather nice to drive but I was a quattro man, although I almost bought a 626 turbo just before that – it was a flyer but the deal fell through on my unloved 100 turbo. My boss 30 years ago was well known for flogging his earlier 626 to outrageously short journey times over hundreds of miles between electricity operation areas of our utility. My lifelong friend has converted from VW to Mazda, and here I am about to do the same from Subaru. Oh and my brother who had the RX-3 finally came back to the fold with a 2014 CX-5. The bad period with Mazda seems to have coincided with their having taken over operations at a Ford factory – Flat Rock, Michigan. So 1995 to 2011, they were a bit meh overall, but still with bright spots here and there. Then Ford booted them out, sold off all but 3.5% of their holdings and left Mazda to go it alone. The cars improved almost at once, now all coming from Japan so far as North American availability was concerned. Operating out of Hiroshima, Mazda isn’t a member of the Tokyo area majors. They’re like lads from Dundee knocking out their own-designed cars when Birmigham and south was the hotbed in the UK. Different. Society is probably different, no doubt their speaking accents are different too. So the hand-shaping of form in clay they go on about is reality, and having seen the strange new Toyota Supra version of the ugly Z4 unveiled today, I’d deem it impossible that Mazda would ever countenance producing such a heavy-handed boy- racer like that. It would offend their sense of aesthetics. All pure speculation on my part, admittedly. I know nothing factual about regional differences in Japan. But the vehicles are different from the Japanese norm. And if that new SPCCI engine works as hoped then they’ll have a real engine innovation on their hands next year to put in that new 3 hatch. Having discovered acoustic glass and sound-deadening mats these last couple of years, progress will be quieter and less raucous and manic for the customer too. Very popular make in Australia is Mazda – they sell 40% as many there as in the EU or the US each year with but a fifteenth of the population. I think your Canon Ixus produces very nice colours and an image that has more depth than one recorded with a smartphone. However, I notice there seems to be a bit of glazy, misty, fogy-ish note to the images that I would think can have two reasons: Either the lens is a bit smudgy, cleaning with a dry cotton cloth will see to that (happens with phones all the time because one easily touches the lens…). Or there is some moisture inside the zoom lenses. Then unfortunately a repair is less straightforward. I still like the pictures! And I do think, especially if clear, they are better than smartphone photos! Thanks for that. I will look at the lens and give it a clean. I am going to print my first set of images from the Ixus this week. Incindentally, I was hunting for a pocket digital camera that was not an Ixus (they still hold their value) and the prices are incredibly low and their are not so many. I noticed in Germany on eBay most of the items were auctions; and in the UK site there were more things for straight. I prefer that and bought a Canon pocket digital for twenty euros. The whole camera thing has been a nuisance. Having given up my smart phone I have an Ixus which I use a lot less even though it is almost always near to hand and I have a Canon u130 point-and-shoot film camera which I use for events at home (and then on holiday). I think I will have reduced my photo production, improved quality but have lost a handle on the archiving if I am running two cameras in parallel. Was there ever a film camera with a date stamp printed on the reverse side? Yes, there were many. Canon 620 with data back for example. Or the Yashica T4d with data back from the point and shoot segment. As much as I love (and still use) film, the merits of digital are hard to ignore when taking photos in varying light conditions, that a film camera by design has difficulties to cope with.